The 15th largest economy in the world, South Korea has developed rapidly since the 1950's thanks to state-led industrialization, which has enabled South Korea to leverage a fast-follower economic strategy and use economies of scale to deliver quality at a lower cost. As a result, South Korea’s GDP per capita has exploded from USD158.2 in 1960 to USD27,538.8 in 2016. However, the South Korean economy is dominated by its conglomerate giants such as Samsung, Hyundai, LG and SK Telecom. These companies, or ‘chaebols,’ make up over half of the Korean economy, so that small and medium enterprises struggle to grow and compete against this dominance. Korea’s efforts are further threatened by a demographic time- bomb. While economic development brought wealth, it has also led to collapsing birth rates in South Korea, a similar problem China will now face. However, unlike China, South Korea does not have extensive natural resources or a large population (South Korea’s population is 60million, compared to Japan’s 120million) to sustain the Korean workforce. Joon Nak Choi suggests that South Korea needs new business strategies, educational policies and social structures in order to meet these challenges and prevent South Korea from slipping into deeper economic malaise. South Korea has relied on its export-oriented development model to become an economic powerhouse, but has now reached the limits of this model. Indeed, Korea’s phenomenal growth has incubated the seeds of its own destruction. Learning from the Korean developmental experience, China has adopted key elements of the Korean development model and has become a potent competitor in electronics and the heavy industries. Meanwhile, the organizational and institutional legacies of late industrialization has constrained Korean efforts to move into technology entrepreneurship and the service sector. These strategic challenges are compounded by a demographic bomb, as social development has led to collapsing birthrates in Korea, much like other developed countries in Europe and Asia. Within the next few years, the Korean workforce will start diminishing in size and aging rapidly, straining the country’s resources and curtailing its growth. In this seminar, Joon Nak Choi will discuss innovations in business strategy, educational policy and social structure that are directly relevant to these problems, alleviating or perhaps even reversing Korea’s economic malaise -- and also how these solutions might also apply towards other East Asian societies facing similar problems. 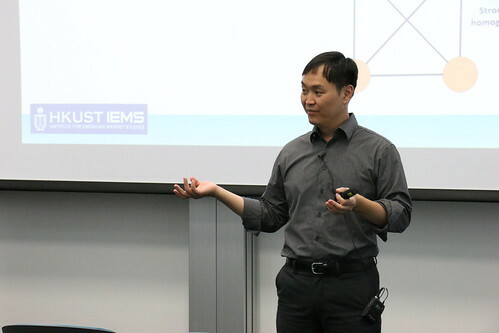 Joon Nak Choi is Assistant Professor of Management and an IEMS Faculty Associate at the Hong Kong University of Science and Technology. Choi spent 2016 as Koret Fellow and Visiting Assistant Professor at the Korea Program at Stanford University's Walter H. Shorenstein Asia-Pacific Research Center (Shorenstein APARC), where he conducted the research to be presented at the seminar. South Korea needs new business strategies, educational policies and social structures in order to meet these challenges and prevent South Korea from slipping into deeper economic malaise.